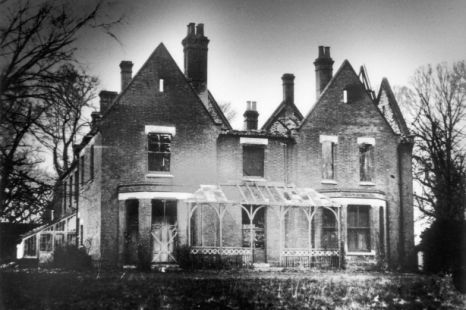 Well done everyone who correctly identified the building in the above photograph as – ‘The Most Haunted House in England’ – Borley Rectory! The connection to Conversations with Sprits being Harry Price; a character in the book - and the real-life psychic investigator at Borley. Well done – Ian Williams! You were plucked from literally ones of entrants from my big hat this morning. Thank you all for getting involved. I will be putting a post in my shed about Borley Rectory later today. I knew that the time spent in my formative years reading encyclopedias of ghosts and hauntings wasn't wasted. Looking forward to my first taste of De Kuyper's finest Cherry Brandy - I shall raise a glass or three to you all! I was more of an Usbourne 'Book of Ghosts' man, myself. There was a story in it about an Irish warehouse that was filled with ghostly hats. J F Derry would like it pointed out that, in fact, he did not answer correctly. J F Derry was, as always, erroneous. As was I ... horribly so!